A girl approaches Barbourofelis fricki , the saber-toothed carnivore that ambushed camels and horses across the expanses of Nebraska roughly 7 million years ago. Her younger brother stands before an 8-foot-long tabletop, digitally dissecting a largemouth bass to identify its parasites. Elsewhere, their mother learns about climate change from the short film projected on a 5-foot-wide globe as their father surveys a photographic mural, getting a dung beetle’s perspective on the Cornhusker State. Cherish Nebraska, the exhibits say. 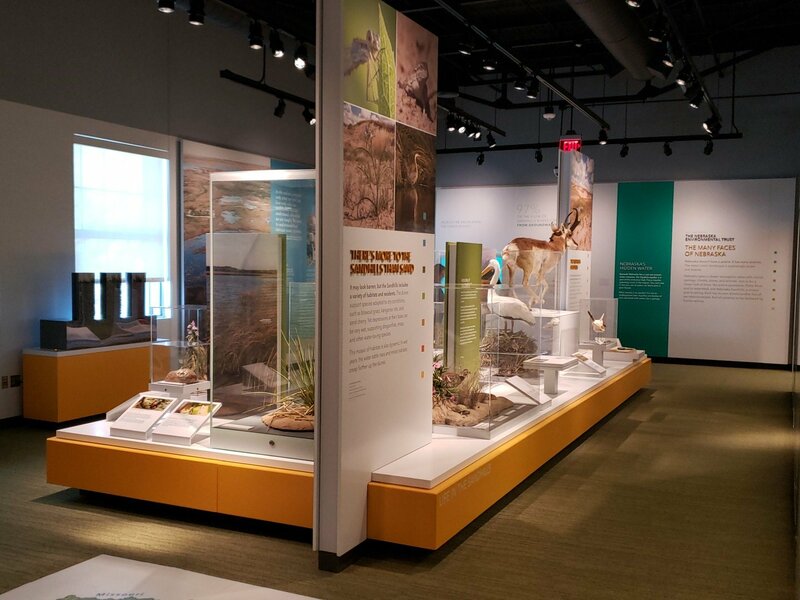 Much of the privately funded, $11.4 million expansion explores Nebraska’s ecosystems across multiple time scales, from mere millennia to hundreds of millions of years ago. Several areas illustrate how warming and cooling have transformed the state’s cover from shallow seas to tropical jungles to massive glaciers to its now-familiar prairies. Many highlight the array of animals, plants and bacteria that once flourished – then migrated or perished – amid that changing climate. Other exhibits explain how scientists collected the vast information that graces the fourth floor. An ice core extracted from Antarctica serves as a lesson in using trapped gas bubbles to determine the composition of ancient atmospheres. A windowed lab space will let visitors watch as researchers examine fossils of the animals and plants that once called Nebraska home. And an exhibit on Paleo-Indians — Nebraska’s original inhabitants — explains how sewing needles found at burial sites confirmed the tiny tool’s outsized importance to surviving an ice age. The expansion’s theme also speaks to sustaining Nebraska’s air, water and soil, Weller said. By tracing the journey of water — down the Rockies to the Sandhills, through the Platte River to the Missouri, from atmospheric heights to the Ogallala Aquifer — visitors can better appreciate humanity’s influence on water quality. They can also learn about the size and impacts of their carbon footprints, Weller said, along with manageable steps toward softening them. Interactivity ranks as a hallmark of the new space, Weller said. A video game has players wielding an atlatl — a spear-based Paleo-Indian weapon predating the bow — to hunt mammoths and other big game in the hope of surviving winter. The parasite-focused digital tabletop lets users choose among numerous animals, and then investigate several of their organs, before viewing their parasites under a simulated microscope. Children can walk – or adults can crawl – through a hollow cottonwood log. “I would recommend that visitors run through the exhibits however they wish to,” Weller said. “The beauty of it is (that) there are so many different layers of things you can look at. Weller said many exhibits engage multiple senses to immerse visitors. A rattlesnake den plays the species’ maraca-like warning, recorded from specimens on the university’s East Campus. The entire floor features large-format photography from native sons Michael Forsberg and Michael Farrell, among others. A full-scale replica of Bison latifrons, an extinct bison species whose height and horns could span roughly 7 feet, will dwarf most visitors. Weller, who became head of the NU State Museum in 2015, said the scale of the expansion easily surpasses any she’s overseen. Matt Joeckel, who served on the original planning committee and is listed as one of the visionaries for the museum expansion. He also provided Conservation and Survey Division materials and content for display, including, but not limited to soil core samples and equipment. Paul Hanson, who is featured in a film on Nebraska soil and provided content for geology displays. Aaron Young, who is featured in a film about Nebraska’s groundwater and provided content for geology displays. Matt Marxsen and John Seaman, who are featured in a video using a drill rig. Martha Shulski and Tyler Williams, who provided feedback on the climate change exhibit. Mary Bomberger Brown, who is featured in a film about the state’s terns and plovers and conservation efforts to support them. Allison Zach, who provide an invasive species specimen on display. John Benson, Dennis Ferraro, T.J. Fontaine, Katie Pekarek, Dave Wedin and the Conservation and Survey Division, who collaborated on projects or provided specimens for display. “You really need the support of the community, and the philanthropy that goes with that, to make it possible,” Weller said. “It really is of the community, for the community, by the community.